Mary Cash: Lady in Her Father’s Garden. Mikeen McCarthy: Early in the Month of Spring/Go For the Water (story)/Flowery Nolan/Selling the ballads/Malone (The Half Crown)/Finn MacCool and the Two-Headed Giant (story)/Dingle Puck Goat/One Fine Summer’s Morning. ‘Pop’s’ Johnny Connors: There is an Alehouse/Gum Shellac/Poor Old Man/John Mitchel. Mary Delaney: Donnelly/Town of Linsborough/Charming Blue-Eyed Mary/If You Ever Go to Kilkenny/Fourteen last Sunday/Peter Thunderbolt/Going to Clonakilty the Other Day/In Charlestown there Lived a Lassie/I’ve Buried Three Husbands lready/My Brother Built me a Bancy Bower/Green Grows the Laurel/The Kilkenny Louse House/Phoenix Island/Navvy Shoes/New Ross own/What Will You Do When We’ll Have No Money? Andy Cash: The Half Crown/Barbary Ellen/Mowing the Hay. Josie Connors: Constant Farmer’s Son. Bill Cassidy: Sam Cooper/Biscayo/The Factory Girl/Pretty Polly/Enniscorthy Fair. Jean Driscoll: The Sea Captain. ‘Rich’ Johnny Connors: Appleby Fair/Rambling Candyman. Paddy Reilly: Buried in Kilkenny/The Blind Beggar. Peggy Delaney: Maid of Aughrim. Bill Bryan: Marie (Maureen) from Gippursland. To the vast majority of the settled folk of Ireland and Britain the people who spend their lives as nomads on their roads are a mysterious people, almost a race apart. The caravans, vans and trailers and tents may be a common sight, but knowledge of their inhabitants remains inadequate: a tissue of fact, pseudo-fact and rumour hedged around with suspicion and distrust. The early song collectors paid little attention to the Gypsies and Travellers who have long populated these Isles. It was only in the early 1950s that collectors working for the BBC began to visit such people. The results were quite staggering. In England and Scotland names such as Phoebe Smith, Carolyne Hughes, Jeannie Robertson, the Stewarts of Blair, Lucy Stewart & Willie MacPhee became well-known to the rapidly growing folkclub audience, while in Ireland we were to hear of the phenomenal singer John Reilly, of Mary Ellen Connors, Annie O’Neill, Paddy Doran and many others. Some recordings of Irish Travellers appeared on a Lyrichord LP (LL178), but it was not until 1983, when a selection of Tom Munnelly’s recordings were issued on the cassette Songs of the Irish Travellers. 1967 - 75 (European Ethnic Oral Traditions - no issue number), that we were fully able to understand the amount of excellent material that had been preserved by these fine Irish singers. In the early 1970’s many Irish Travellers had moved to London, presumably in search of work, and some were befriended by the collectors Jim Carroll, Pat Mackenzie and Denis Turner. In 1986 Malcolm Taylor, on behalf of the EFDSS, issued a cassette, Early in the Month of Spring, which contained fourteen songs and one story from the collection made by Jim, Pat and Denis. Now, all of these recordings have been reissued, along with many previously unissued songs, on the double CD From Puck to Appleby. And what recordings! Rod Stradling has already suggested that these two CDs could be the best traditional albums to be issued this year, and, who knows, he could just be right - although, with forthcoming CDs of Phil Tanner, Cornish Travellers and Fred Jordan, it might be a tight thing. But, was there ever a time when so much incredible material was so readily available? Edith Fowke, the Canadian song collector, once said that many of her ‘best’ songs came from the weakest singers, and that the ‘good’ singers often had the least interesting songs. Well, this is not the case here. All the singers are excellent and the songs are wonderfully complete versions of seldom collected pieces. There are a handful of ballads (6 sung Child ballads, together with Go For the Water, a cante-fable version of the ballad that Child called Get Up and Bar the Door), several ballads that were collected together by G Malcolm Laws, some splendid lyrical songs, songs about Travellers and their way of life, plus a good telling of the folktale Finn MacCool and the Two-Headed Giant. All in all, over two and a half hours of first-rate material. Other singers employ different singing styles. Bill Cassidy, for example, is a wonderful singer who, at times, seems to have been influenced by the sean-nós style of singing, especially on the slower ballads, such as Biscayo or Pretty Polly, the latter being a fine version of The Outlandish Knight complete with talking parrot. Tom Munnelly’s cassette included another ballad about a talking bird, Lady Margaret, a version of Young Hunting (Child 68), which Tom said was frequently encountered on the lips of Traveller singers, and I am again wondering if such items were/are to be found more frequently with Traveller singers, rather than non-Travellers. And, talking of supernatural ballads, I note that comparison is made between Mary Delaney’s song Peter Thunderbolt (Roud 1453) and The Outlandish Knight. Some years ago, when I suggested a supernatural connection with Phoebe Smith’s version of Peter Thunderbolt, which Phoebe called Captain Thunderbold, Pat Mackenzie took me to task, suggesting that I was wrong. Is this still the case? Almost half of the songs come from Mary Delaney, a lovely singer with an eclectic repertoire. Some of Mary’s songs are better known under different titles. Town of Linsborough is a version of The Wexford Girl, New Ross Town is Seventeen Come Sunday, while In Charlestown there Lived a Lass is well-known as Floating Down the Tide/The Lily White Hand. The song notes to the latter seem to suggest, so far as Scotland is concerned, that it has only been collected in Aberdeenshire. In fact the Scottish Traveller Duncan Williamson, who is not from the north-east, sings part of it under the title In Kilmarnock Town. What is especially notable is how so many of these songs (not just Mary’s song, but just about all the songs heard on the CDs) are complete versions. Many English gypsies sing fragmented, or confused, songs. But this is not the case here. As regards New Ross Town, the notes state that, ‘We recorded this from Mary on a number of occasions and, although it was one of her favourite songs and among the first she gave us, she never sang it the same way twice.’ The version included on the CD is, however, a complete song, one that can stand on its own. Another song, The Kilkenny Louse House, was often incomplete; but only in the sense that, ‘on most occasions she sang it for us she was unable to reach the end for laughter’! The one ‘incomplete’ song, The Blind Beggar, is a version of the 16th/17th century blackletter broadside The Rarest Ballad that Ever was Seen of the Blind Beggar of Bednall Green, sung here by Mary’s brother, Paddy Reilly. As the original ballad ran to some 67 verses we can see that quite a bit of the story is now missing. Mikeen McCarthy also sang the ballad and there is a fascinating track devoted to Mikeen telling how he would sell broadsides of his father’s version of the song. It seems that, as late as the 1950s, Travellers would sell such sheets at rural fairs in Ireland. Following his father’s death, people would ask Mikeen for the words to his father’s songs. In the end Mikeen visited a printer, dictated the words to the printer, and then sold the sheets that the printer provided. The songs included sentimental pieces, such as Smiling Through and There’s No Place Like Home, as well as more up-to-date songs like A Pub With No Beer and more traditional items such as Bessie of Ballentown Brae and The Bonny Bunch of Roses. Packie Byrne once told me that he had seen sheets being sold in the 1930s, but I was unaware that the practice had gone on for so long in Ireland. I said above that the song notes were extremely good. They are, however, limited to the song texts and little is said about the tunes, some of which are really beautiful - Charming Blue Eyed Mary, Mowing the Hay and The Town of Linsborough for example. Several of the tunes have been used to carry other songs. There is an Alehouse uses a tune similar to one used by Packie Byrne for his version of The Holland Handkerchief. The Half Crown’s tune resembles the one for Cod Liver Oil, Gum Shellac uses The Jolly Tinker tune, and both The Constant Farmer’s Son and Flowery Nolan are sung to Come All You Tramps and Hawkers. If Ever You Go to Kilkenny has a tune that turns up in such songs as My Father Was Hung for Sheep Stealing and Kibosh the Cobbler, while Going to Clonakilty is based on She’ll Be Coming Round the Mountain (complete with a ty yi yippy chorus). The bawdy Marie from Gippursland employs the same Scottish pipe tune that Scottish Travellers use for The False Knight Upon the Road and The Dingle Puck Goat is sung to The Bold Thady Quill. The tune for The Rambling Candyman is, perhaps, best-known as The Hot Asphalt, and many English singers use the Phoenix Island tune for their song Go and Leave Me if You Wish It. Some songs seem to be the exclusive property of the Traveller’s themselves. ‘Rich’ Johnny Connors sings of the English Appleby Fair, a song that English gypsy Jasper Smith knew as a poem about Epsom Races, while ‘Pop’s’ Johnny Connors sings his own composition Gum Shellac, with its wonderful opening line, ‘ We are the travelling people like the Picts or Beaker Folk’. Some history there! Mary Delaney’s Going to Clonakilty the Other Day concerns a ‘small incident’ among Travellers, although the singer had forgotten just what the original incident was, though ‘Pop’s’ Johnny Connors’ Poor Old Man concerns a fight between Travellers that took place in the town of New Ross, Co Wexford. Some Travellers described the fight as, ‘the second Battle of Aughrim’. Rambling Candyman describes an event that occurred when the singer, ‘Rich’ Johnny Connors paid a visit to Scotland. And this brings us to an interesting, and important point. Travellers seem to have migrated frequently between England, Ireland and Scotland (not, of course, forgetting Wales). The Brazil Family from Gloucestershire, for example, spent time in Ireland, as did the Stewarts of Blairgowrie. 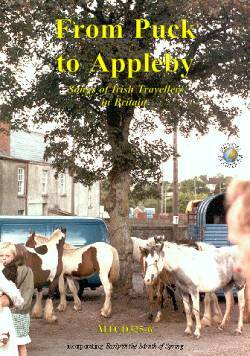 And Irish Travellers have visited England and Scotland. Travellers, be they English, Scottish or Irish, love to sing and tell tales, so, is it any wonder that songs, ballads and folktales from all over the place should be so well-known to such people. Walter Pardon, the Norfolk singer, felt that some of his Irish songs had been brought to his part of the world by Irish labourers who were building a near-by canal. This may well be the case. But I would suggest that many songs and stories were also carried about, and passed on, by Travellers. According to Jim and Pat, ‘These CDs are not intended to be an academic study of Traveller’s repertoires but are for the enlightenment and enjoyment of those interested in traditional songs and singers.’ Fair enough. But I bet that, over the years, the academics will be getting as much enjoyment from these recordings as will the rest of us. Jim and Pat now have a large collection of recordings. From Puck to Appleby is only the tip of the iceberg. Is there any chance that there will be follow-up CDs? I certainly hope so.